Engrossed in their cellphones, approximately 20 students sit in a room filled to the brim with “WI Back Her” posters, clipboards and other presidential campaign paraphernalia. These students click away at their screens calling last minute voters to encourage them to participate in Democratic presidential nominee Hillary Clinton’s campaign in Wisconsin. Operating out of a small office just off the 400 block of State Street, these students are among several who have volunteered to help Clinton’s campaign. Others do the same for Republican nominee Donald Trump, University of Wisconsin College Republicans Vice-Chair Jake Lubenow said. Almost 100 UW students currently volunteer through College Republicans. 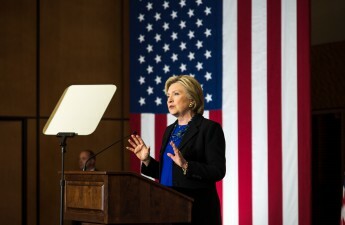 College Democrats President Augie McGinnity-Wake said it is difficult to estimate how many volunteers have worked with Clinton’s campaign because the numbers fluctuate over time, but many volunteers have stuck with her since the beginning of the election season. With just a week to go, the campaigns are making their final push to get more students to the polls — using volunteers to make phone calls, drop off mailers and knock on doors. Student volunteers often work with the campus branches of College Republicans and College Democrats, which work directly with the state parties to turn out voters. McGinnity-Wake said being a volunteer can help a student get a taste of what it is like to work on a campaign. 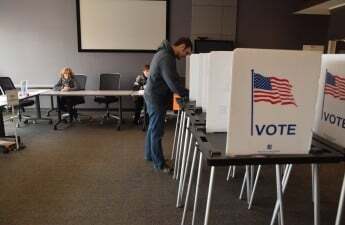 City officials say voters are requesting absentee ballots and voting early at record numbers. City Clerk Maribeth Witzel-Behl said voters in Madison have cast 26,527 absentee ballots since Oct. 28. The city has set up 14 locations for people to vote early, including one at the Student Activity Center and another at Union South. 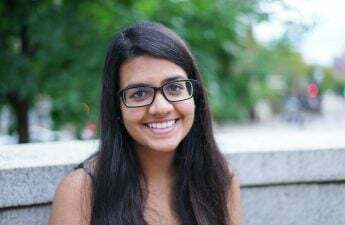 Associated Students of Madison Secretary Madhuvanthi Sridhar said approximately 150 students have been voting early every day at the SAC and Union South since Oct. 24. This means an estimated 1,000 students have voted since early voting began on campus locations. ASM has registered more than 3,000 students to vote since June, Sridhar said. So far, the greatest challenge for campaigns has been getting undecided voters to the polls. Students make up the largest fraction of the undecided voter population in Wisconsin, UW political science professor Barry Burden said in an email to The Badger Herald. Most of them also don’t like their choices, according to the latest Marquette University Law School poll. The poll, released last month, found 67 percent of 18-29 year olds view Trump unfavorably, while 59 percent say the same of Clinton. That, Burden said, implies students are less likely to vote for the two major parties and either stay home or vote for third party candidates such as the Libertarian Party’s Gary Johnson or the Green Party’s Jill Stein. On the Republican side, Lubenow said Trump’s comments about sexual assault may have deterred some Republican students from voting for their party’s nominee. Other Republican students are still voting for Trump despite raising major reservations over the 2005 video tape and subsequent allegations of sexual assault from at least 10 women. That includes Grace Prewitt, a junior at UW who said while she’s still supporting Trump, she’s not necessarily excited about it. As a Christian, she said it’s hard to justify supporting him in light of his comments about women, but she said likes some of his choices so far, especially choosing Indiana Gov. Mike Pence as his running mate. “I do not at all support what he said and he was not my first choice, but now there’s bigger issues at stake,” Prewitt said. 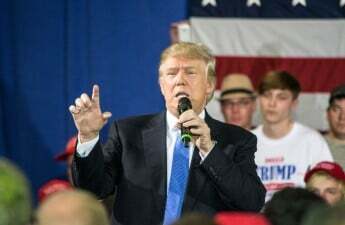 Prewitt is a member of the College Republicans, which decided to endorse Trump in late September, with less than two months to go before the election. On other campuses, College Republicans had conflicting sentiments about Trump. The New York Times reported Yale University College Republicans’ endorsement of Trump led to it splitting into one pro-Trump group and the one against. Harvard College Republicans openly condemned Trump and said they would rather vote for Clinton over him. The UW College Republicans said in a statement they will not isolate Republican students who disagree with the organization’s continued endorsement of Trump. Instead, College Republicans looks to include and give a voice to all conservative UW students. 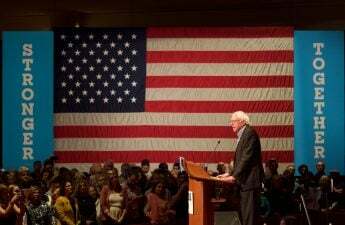 Some Democratic students have also expressed mixed reviews of Clinton, following a primary election in which U.S. Sen. Bernie Sanders’ support among young voters helped make the race more contested than many had predicted early on. Some in the Badgers for Bernie group have gotten on board with Clinton’s campaign, but others remain unconvinced. That includes the group’s president, Jackie Spaight, who said she is not convinced to vote for Clinton despite Sanders’ outright support for Clinton. Spaight said Sanders’ endorsement is not enough to encourage her to vote for Clinton because she simply cannot identify with Clinton’s campaign. While most students who supported Sanders are likely to vote for Clinton or Stein, Spaight said students should not blindly accept campaign messages. Students need to decide for themselves if they can resonate with a candidate or not, Spaight said. Burden said Sanders’ supporters’ apathy toward Clinton could be a problem for her because young voters have been an important part of the Democratic coalition. But Clinton still has an advantage over Trump. According to the October Marquette poll, 46 percent of 18-29 year olds would rather vote for Clinton compared to 33 percent for Trump. McGinnity-Wake said the election has been “indisputably nasty” for a lot of students, especially because for many of them, it is the first presidential election in which they are able to vote. In some cases, these students choose not to vote at all rather than vote halfheartedly. Because of this, McGinnity-Wake said it is essential that campaigns work to engage students and show them what their vote can do. The Clinton campaign has also sent a lengthy list of surrogates to the UW campus to encourage young voters to join Clinton’s campaign. At a Monona Terrace rally last month, Sanders said voters should support Clinton because of her support for making college more affordable. 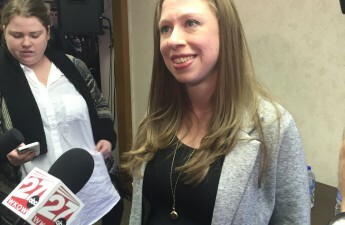 Other Clinton surrogates who have made Madison stops include U.S. Sen. Elizabeth Warren and Clinton’s daughter, Chelsea. Hillary for Wisconsin spokesperson Nathan Evans said students are already excited about the election but having surrogates come and talk to them brings the issues that candidates are advocating for home. McGinnity-Wake said having contact with Clinton’s campaign has been a key factor driving students to vote and volunteer. 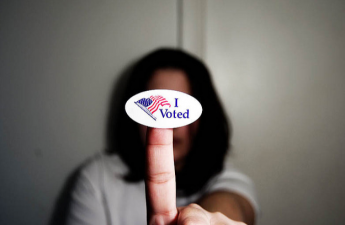 “[Campaigns are] out there to have conversations with students about voting, about the candidates and who they should be voting for,” McGinnity-Wake said. Unlike other Republican presidential contenders, Trump did not come to UW or Madison during the April primary election, and he’s skipped the city in the general election as well. But in early October, Pence called in to talk to College Republicans about the importance of their vote on Trump’s behalf. Campaigns across party lines agree that the student voice is critical. Whether it involves expressing concerns or giving praise, student voters need to ensure they do not go unnoticed Nov. 8, Democratic Party of Wisconsin campus organizer Brianna Koerth said. Nina Kravinsky contributed to the reporting of this article.